Registration for Cisco Live 2015 NetVets opened today and will be open for all attendees in a week. The scheduler is located at https://www.ciscolive2015.com/connect/mySchedule.ww. I still need to trim a session or two to make room for the free certification test and social networking. 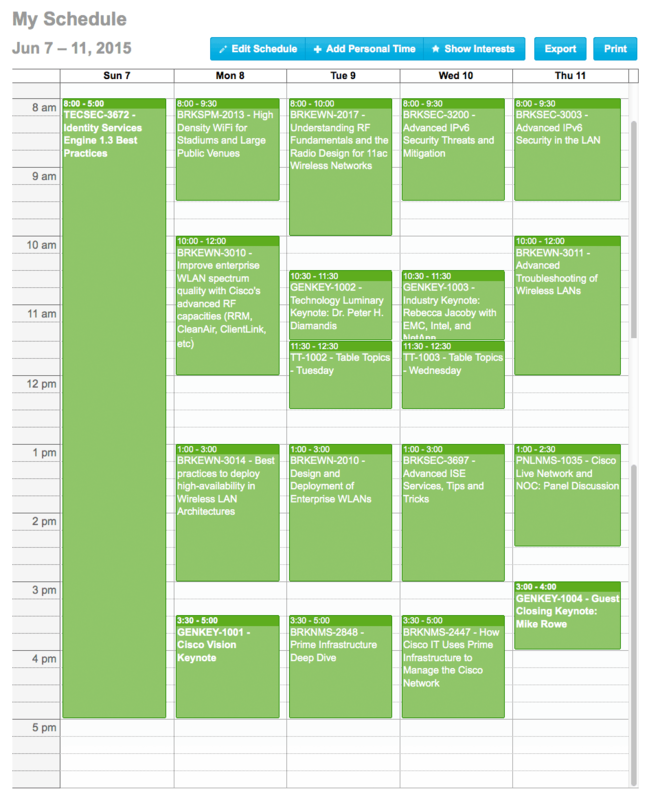 Since so many of the sessions I’m interested in are in small rooms this year, I wanted to get a schedule set and then trim as needed rather than try to add sessions later. If you’re still up in the air about a techtorial for Sunday, I’d highly recommend TECEWN-3002 – Advanced Enterprise WLAN Deployment. I took it last year and will be taking it again in the future. In general I try to mix up which sessions and techtorials I take to keep things fresh, so I’m signed up for the ISE 1.3 session this year. Two other must attend sessions for wireless folks are BRKEWN-3010 – Improve enterprise WLAN spectrum quality with Cisco’s advanced RF capacities (RRM, CleanAir, ClientLink, etc) with Jim Florwick, and BRKSPM-2013 – High Density WiFi for Stadiums and Large Public Venues with Joshua Suhr and Matt Swartz. 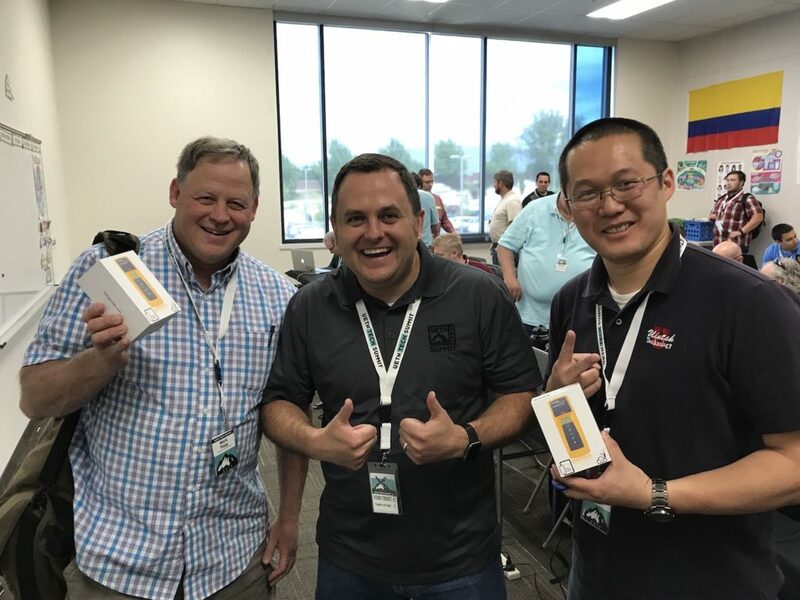 If you’re going to be going to Cisco Live for the first time, make sure to check out Scott McDermott’s great guide at http://www.mostlynetworks.com/guide-cisco-live/. Update 1 (25 March 2015): At the recommendation of @mrncciew, I swapped in BRKCRS-3900 in place of BRKSEC-3697 for my Wednesday at 1pm slot. Since today is Valentine’s Day I thought I’d do a post about love. I have much love for my Wi-Fi buddies; they have taught me so much and continue to teach me new things on a regular basis. I also have lots of love for all of the companies out there making awesome Wi-Fi gear and tools. They make our jobs easier and more interesting. And I’d introduce him to the fine folks at iRobot who make great autonomous robots like the Roomba and the Ava. My hope is that they would make a Wi-Fi surveying robot baby. Sure, the name of the game in Wi-Fi design work has changed from coverage to density, but there is still a need to do post-installation surveys to make sure that you’re not missing the forest for the trees. I’d love to have a rugged outdoor rover or drone that could do regular surveys of outdoor coverage of my campus. So it might be too late to get such a relationship arranged in time for the festivities today. But perhaps in a few years, we might see a Wi-Fi survey-bot deliver a Father’s Day card to Charles.